After my post about swimming with whale sharks in Australia some people commented they would afraid to do it, so I started research about any aquariums in the world to see whale sharks. I named my post as TOP 5 aquariums, but after short research I found information only about 7 aquariums featuring whale sharks so here is full list. To be honest I am not big lover of aquariums or zoo. My preference is to see animals in their natural environment. According to the study done at Okinawa aquarium whale sharks live for only average 16 months in captivity. Naturally they can live up to 70 years. So personally I probably won’t be visiting any of these aquariums and would prefer to swim with whale sharks again or just go for whale watching tour. According Wikipedia it should be two whale sharks at Polar Ocean World, but I didn’t find any other sources confirming that and on their web page did see only pictures of Beluga whales, but nothing about whale sharks. Yantai Aquarium is another aquarium with no much information, except huge concern from conservationists as there are 5 whale sharks in very tiny 27 meters by 16 meters (88 feet by 52 feet) aquarium. It is hard to imagine 10-15 meters (30-50 feet) long adult whale shark in such “box”. At Kenting National Museum of Biology and Aquarium there is aquarium called The Open Ocean Aquarium. There is no information about measurements except it is largest aquarium in Taiwan and besides 13 dolphins it features one 16 meters (52 feet) long whale shark. Because all official information about Ioworld Aquarium is in Japanese it is hard to find precise numbers. According online reviews the aquarium isn’t too big and presentations are in Japanese, but it is not crowded and features single whale shark. The largest tank “Pacific Ocean” in Kaiyukan aquarium is 9 metres (30 feet) deep and holds 5.4 million liters (1.4 million US gallons) of water. Besides whale shark you can see Manta ray, Bluefin tuna, Spotted eagle ray in the “Pacific Ocean”. The main tank at Churaumi Aquarium called the Kuroshio Sea, holds 7.5 million liters (1.98 million US gallons) of water. When the aquarium was opened in 2002 it had largest acrylic glass panel in the world measuring 8.2 by 22.5 metres (27 by 74 feet) with a thickness of 60 centimetres (24 inches). There are 3 whale sharks in aquarium at the moment. At Georgia Aquarium is located largest tank in the World. Ocean Voyager holds 24 million liters (6.3 million US gallons) of water and was specially designed to house whale sharks, the largest fish species in the world. At the moment there are 4 whale sharks in the aquarium and can watch them live on web cam or … you can swim with whale sharks in aquarium. A swim is guaranteed and you don’t need to worry about sea sickens. so beautiful.. but i prefer seeing them large mammals in the wild;) Ahhh.. the deep blue! Thanks for posting! 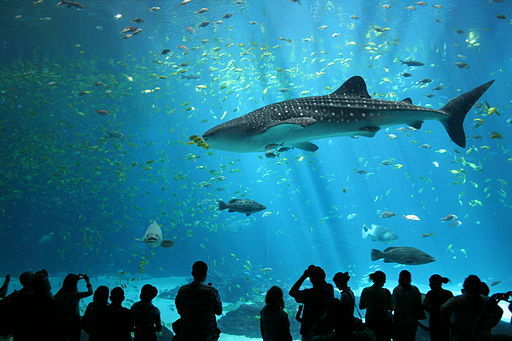 It would be cool to see whale sharks at any of these aquariums! These are amazing aquariums! I have only been to the Monterey Bay Aquarium and that was so much fun. If you are not a lover of aquariums or zoos and you’ve learned that whale sharks only live 16 months in captivity, then why are you writing about/promoting these places? Whale sharks are endangered species, do you think people should pay to have them captured from the wild so they can die in a tank months later. How about educating your readers who ask for whale shark tank experiences instead of encouraging this abuse. I am not promoting aquariums, but people are looking for information about aquariums anyway. So I hope at least some of them will start thinking do they really want to visit aquarium or to see shale sharks in the wild if they visit this page. The whale sharks at Georgia Aquarium have been there for 13 years. They have set a high bar for the care of these animals. They have a very extensive reasesrch program headed by Dr Alister Dove. The whale sharks at the Georgia Aquarium have been there since they opened in 2005. Perhaps, there were issues a long time ago, but I guess they figured out the problem and fixed it. The last thing an aquarium wants to happen is to shorten an animals life. Usually, animals live a longer life in responsible human care.